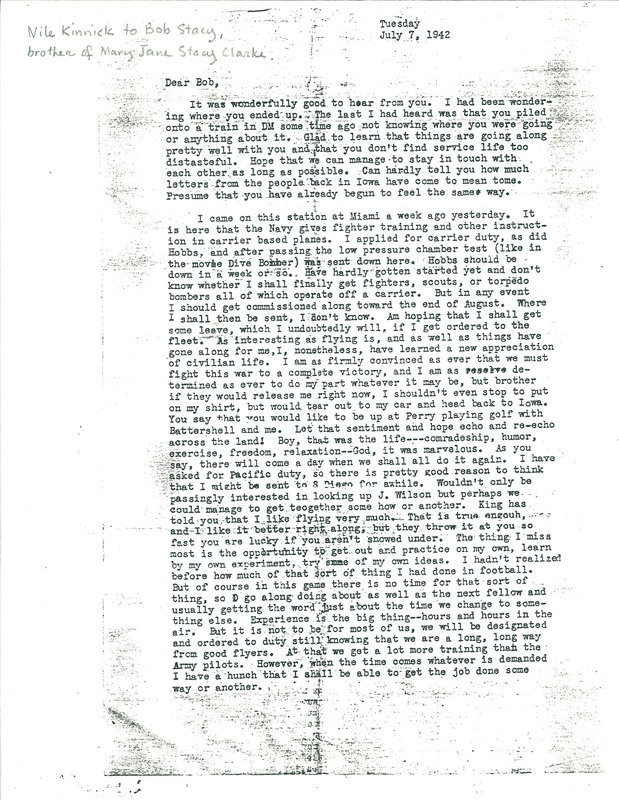 Nile Kinnick to Bob Stacy, brother and Mary Jane Stacy Clarke Tuesday July 7, 1942 Dear Bob, It was wonderfully good to hear from you. I had been wondering where you ended up. The last I had heard was that you piled onto a train in DM some time ago not knowing where you were going or anything about it. Glad to learn that things are going along pretty well with you and that you don't find service life too distasteful. Hope that we can manage to stay in touch with each other as long as possible. Can hardly tell you how much letters from the people back in Iowa have come to mean tome. Presume that you have already begun to feel the same way. I came on this station at Miami a week ago yesterday. It is here that the Navy gives fighter training and other instruction in carrier based planes. I applied for carrier duty, as did Hobbs, and after passing the low pressure chamber test (like in the movie Dive Bomber) was sent down here. Hobbs should be down in a week or so. Have hardly gotten started yet and don't know whether I shall finally get fighters, scouts, or torpedo bombers all of which operate off a carrier. But in any event I should get commissioned along toward the end of August. Where I shall then be sent, I don't know. Am hoping that I shall get some leave, which I undoubtedly will, if I get ordered to the fleet. As interesting as flying is, and as well as things have gone along for me, I, nonetheless, have learned a new appreciation of civilian life. I am as firmly convinced as ever that we must fight this war to a complete victory, and I am as determined as ever to do my part whatever it may be, but brother if they would release me right now, I shouldn't even stop to put on my shirt, but would tear out to my car and head back to Iowa. You say that you would like to be up at Perry playing golf with Battershell and me. Let that sentiment and hope echo and re-echo across the land! Boy, that was the life---comradeship, humor, exercise, freedom, relaxation--God, it was marvelous. As you say, there will come a day when we shall do it again. I have asked for Pacific duty, so there is pretty good reason to think that I might be sent to S Diego for awhile. Wouldn't only be passingly interested in looking up J. Wilson but perhaps we could manage to get teogether some how or another. King has told you that I like flying very much. That is true engouh, and I like it better right along, but they throw it at you so fast you are lucky if you aren't snowed under. The thing I miss most is the opportunity to get out and practice on my own, learn by my own experiment, try some of my own ideas. I hadn't realized before how much of that sort of thing I had done in football. But of course in this game there is no time for that sort of thing, so I go along doing about as well as the next fellow and usually getting the word just about the time we change to something else. Experience is the big thing--hours and hours in the air. But it is not to be for most of us, we will be designated and ordered to duty still knowing that we are a long, long way from good flyers. At that we get a lot more training than the Army pilots. However, when the time comes whatever is demanded I have a hunch that I shall be able to get the job done some way or another.